Today (29 March), RAF Quick Reaction Alert (QRA) Typhoon fighter aircraft scrambled from RAF Lossiemouth, with an RAF Voyager from Brize Norton, to monitor two Russian Blackjacks approaching UK airspace. Crown copyright. Today (29 March), RAF Quick Reaction Alert (QRA) Typhoon fighter aircraft scrambled from RAF Lossiemouth, with an RAF Voyager from Brize Norton, to monitor two Russian Blackjacks approaching UK airspace. Our brave RAF pilots have shown again that we are ready to respond to any threat to the UK. 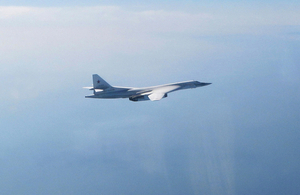 Alongside our NATO allies, we must remain vigilant and aware of Russian military activity. The RAF routinely identify, intercept and e****t Russian aircraft that transit international airspace within proximity to the UK’s area of interest and continue to be on call every day. This is the second time this week RAF aircraft have taken to the air to investigate Russian activity, following a similar incident on Wednesday evening, but on that occasion, an intercept by the Typhoons was not necessary.